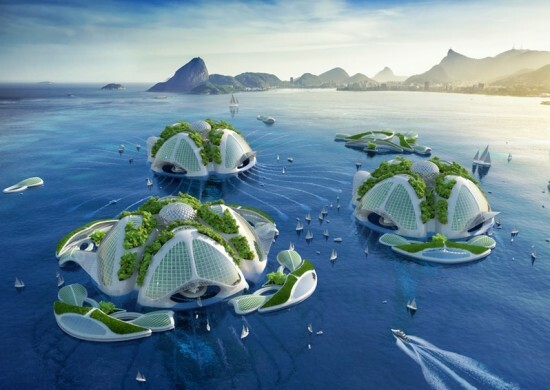 Belgian architect Vincent Callebaut has revealed ambitious plans for Aequorea, a series of self-sufficient floating villages constructed of recycled plastics from the Great Pacific garbage patch. 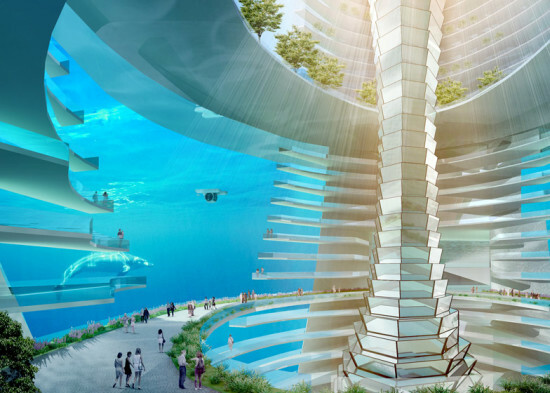 Each jellyfish-like eco-village would spiral down to the sea floor—forming 250-floor “oceanscrapers”—and house up to 20,000 people. The 250 floors would contain science labs, offices, hotels, sports fields, and farms. 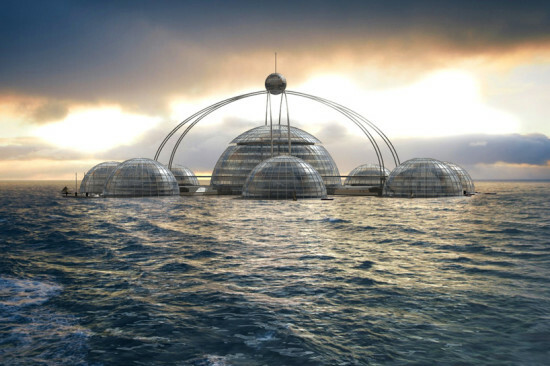 See the Aequorea project page here. Callebaut also designed Lilypad, a floating city that could house 50,000 people. 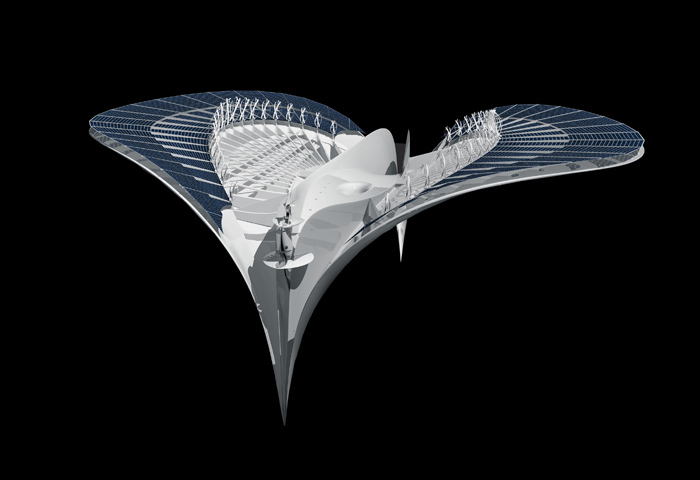 The proposed city’s form mimics the intensely ribbed Victoria water lily. An artificial lagoon would lie in the center, surrounded by three marinas and three mountains. These ribs would house work, shopping, and entertainment, while food and biomass would be produced below the water line. Callebaut hopes for Lilypad to be built by 2100. See the Lilypad project page here. The Ocean Spiral, an underwater metropolis proposed by Japanese construction firm Shimizu Corp, would drive energy from the seabed and house up to 5,000 people. Homes, businesses, and hotels would reside in a sphere 1,640 feet in diameter and connect to a 9-mile spiral that extends to a submarine port and factory. 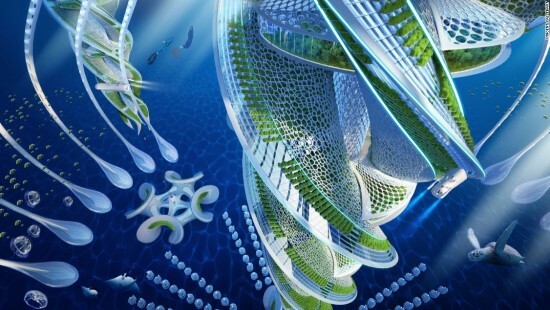 Ocean Spiral would use micro-organisms to turn carbon dioxide into methane. According to Shimizu Corp, the project is being researched by Tokyo University, Japanese government ministries, and energy firms. Shimizu Corp believes the necessary technology will be available in 15 years and construction would take five. See the Ocean Spiral project page here. London based design consultant, Phil Pauley, designed Sub Biosphere 2, a network of biomes to house 100 people below water. The center biome would rise 400 feet above water, submerge 20 feet below water, and regulate fresh air, water, food, electricity, and atmospheric pressure. 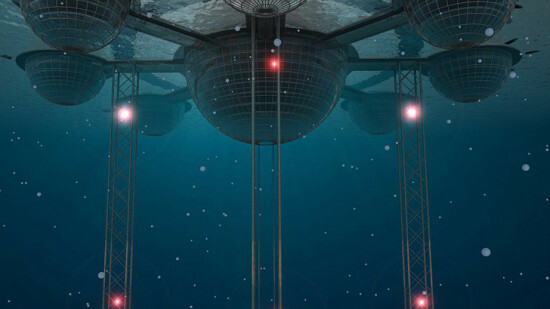 The surrounding biomes would split ten stories above water and ten below. 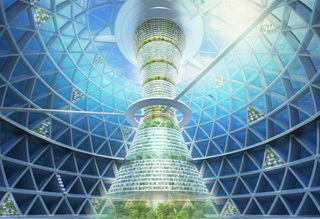 Residents would live off hydroponic crops, grown in the biome seed bank. See Phil Pauley’s webpage here. 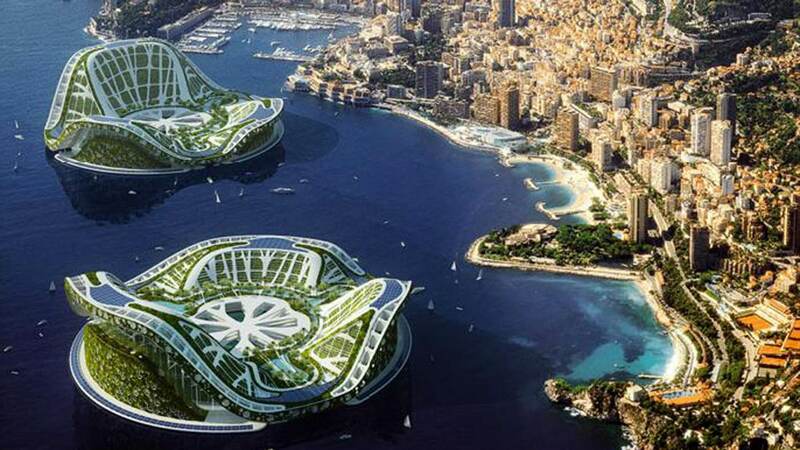 Chinese construction firm, CCCC-FHDI, commissioned England and China based firm, AT Design Office, to design a four-square-mile floating city utilizing the technologies CCCC-FHDI is using to build a 31 mile bridge between Hong Kong, Macau, and Zhunai. 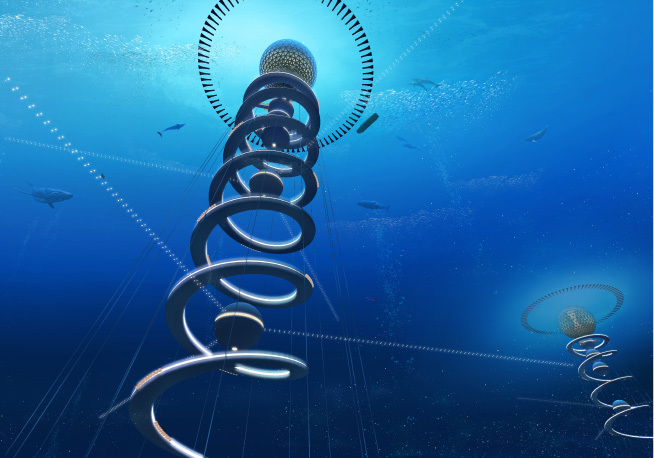 AT Design Office proposes prefabricated hexagons connected by underwater tunnels. 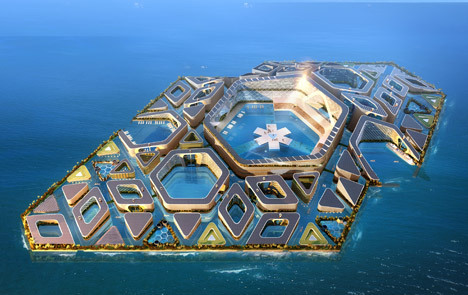 The hexagons would contain residential, commercial and cultural facilities. All residences would have ocean scenery from every direction. The top of each block would have a club, while the bottom would contain an equipment room and a gravity regulation system. See AT Design Office’s webpage here. 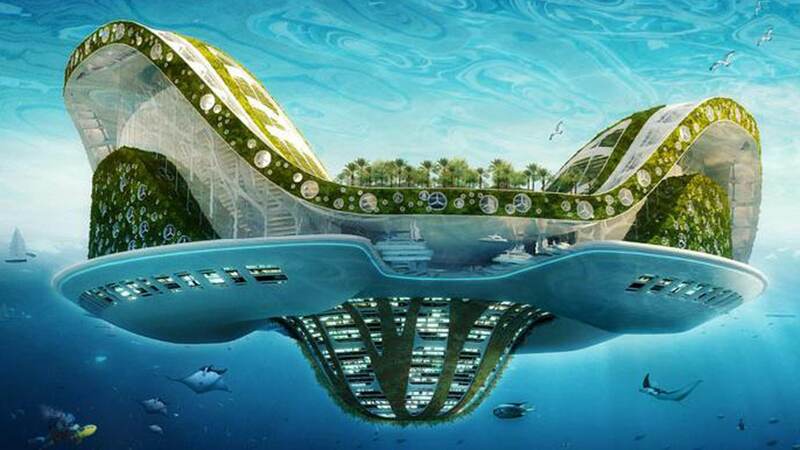 This 3,000-foot-long, 1,600-foot-wide manta ray is actually a floating university campus, called the City of Mériens. French Architect Jacques Rougerie designed the city to accommodate 7,000 academics for research and education. 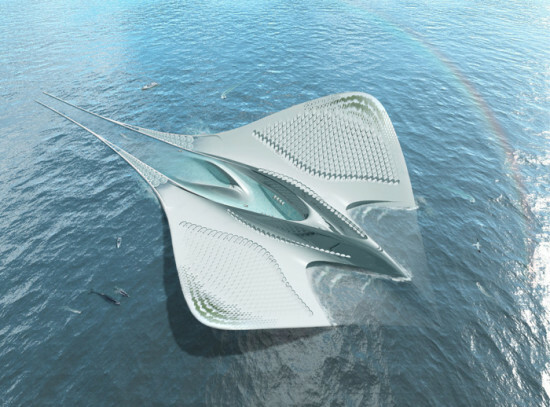 The city contains classrooms, lecture halls, laboratories, residences, and recreation, which would all run on renewable marine energy to produce zero waste. Rougerie told Weather.com, “I designed the City of Mériens in the form of a manta ray because it was the best design to accommodate such a community with regards [to] the best possible correlation between space and stability needs.” The manta ray form is to counteract turbulence, while the descended structure is to maintain steadiness—rising 200 feet above water and 400 feet below. See Jacques Rougerie Architecte’s webpage here.